In a world where history took a different path, modern Tokyo is a corrupt, isolated city where corporate soldiers and idealistic militants battle with swords on the neon-lit streets. Through this storm of blood stride two master swordsmen, each driven by a terrible purpose. One, to avenge the murder of his bride-to-be. The other, to take back the dream that was denied him. Winter has ended. Spring has begun. The flowers blooming crimson will guide the two warriors to their destiny. And nothing but corpses will be left in their wake. Set in an alternate universe Tokyo, Hanachirasu is a dark, atmospheric visual novel about two men dedicated to the sword. It features realistic depictions of traditional Japanese swordsmanship and martial aesthetics, making it an excellent game for those with an interest in Japanese culture. A mercenary in service to the Takigawa Corporation, which rules Tokyo's economy with an iron fist. A disciple of the Karuno-ryu school of swordsmanship, Akane is an efficient and deadly combatant more than a match for opponents twice his size. He desires only to settle the score with his nemesis, Igarasu Yoshia, and will destroy anything that stands in his way. A mercenary in service to the Hokodome-no-Kai, an underground militia that fights to overthrow Takigawa. 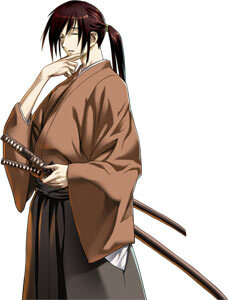 He was once Akane's elder disciple in the Karuno-ryu school of swordsmanship. 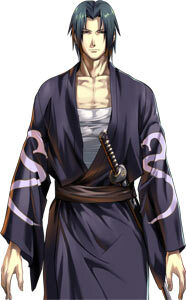 Now he pursues Akane relentlessly, seeking vengeance for the murder of his bride-to-be. 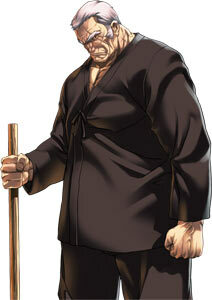 Igarasu is a master of iai, the art of the draw-and-strike, and wields an inhuman technique known as the Hiru-no-Tsuki. "You're the only one I have, Akane." The president of the Takigawa Corporation. Forced from childhood to behave as a man, she clings to Akane as the only person who wants her to be a woman. "Don't sulk. You know I love you." 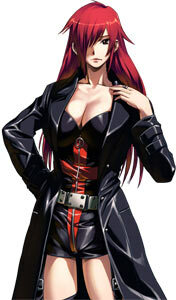 An eccentric woman who shares history with both Akane and Igarasu. She watches passively from afar as their conflict proceeds toward its inevitable conclusion. "Kill me if you can, but you're coming with me." Yumi's personal bodyguard. A mighty warrior who has loyally served three generations of Takigawa presidents, he finds himself disturbed by Akane's influence over Yumi. "Is it just me, or have I run into someone I reeeeally shouldn't have?" A member of the Hokodome-no-Kai. He fights beside Igarasu against the Takigawa Corporation. Chief of the Takigawa Corporation's Second Division. As a member of the vice president's faction, she works tirelessly to undermine Yumi's authority. A story of revenge, obsession, and the way of the sword, set in an alternate history where the Empire of Japan survived World War Two.